Joe Simpson is having his schedule in the Braves TV booth drastically cut back. A change is happening in the Atlanta Braves TV booth – finally. As first reported by the Atlanta Journal-Constitution, analyst Joe Simpson will have his TV workload dramatically slashed in 2019, down to “20 or 30 TV games,” with a much larger workload on radio (reportedly around 100 or so). Simpson will be replaced in the Braves booth by Jeff Francoeur, who is expected to work approximately 100 games this season. Tom Glavine will also work more games in 2019, and Chip Caray (sigh) remains the team’s play by play announcer. The Braves, through team CEO Derek Schiller and Fox Sports South general manager Jeff Genthner, emphasized that Simpson’s numerous “controversial” (or described more truthfully, “stupid”) comments last year played no role in Simpson’s demotion. Simpson himself seems surprised by the extent of the cutback, but did admit that he proposed scaling back his workload on television. He then went on to talk about the “incidents” last year, which involved questioning the age of NL Rookie of the Year runner-up Juan Soto and criticizing the batting practice attire of Dodgers infielder Chase Utley. Simpson was also not a part of TBS’s MLB Postseason coverage this year. The Braves broadcast crew finished 20th in our local MLB announcer rankings this summer, right in line where they’ve finished in recent years. He’s been a part of Braves broadcasts for nearly 30 years, working on TBS, Peachtree TV (remember Peachtree TV? Jaded Braves fans around in the late 2000s like myself do), Turner South (please don’t remind me of Turner South), and now, Fox Sports South, working with the late, legendary duo of Skip Caray and Pete Van Wieren, current TV partner Chip Caray, and former TV and future radio partner Don Sutton, among others. On Braves radio, Simpson will work with Sutton, Ben Ingram, and Jim Powell on a rotating basis, and Simpson expects to call about 100 games on radio this season. The real story here shouldn’t be Simpson’s demotion, but instead Francoeur’s demotion. The former Braves first round pick, who grew up in the Atlanta area, has received plenty of praise (including from myself, which is rare) for his work on radio and TV. Working with Caray, who has seemingly been mailing his work in for years, on a full-time basis could stifle his development, but that’s a risk the Braves were willing to take compared to the alternative of losing Francoeur to a competitor on either the local or national level. 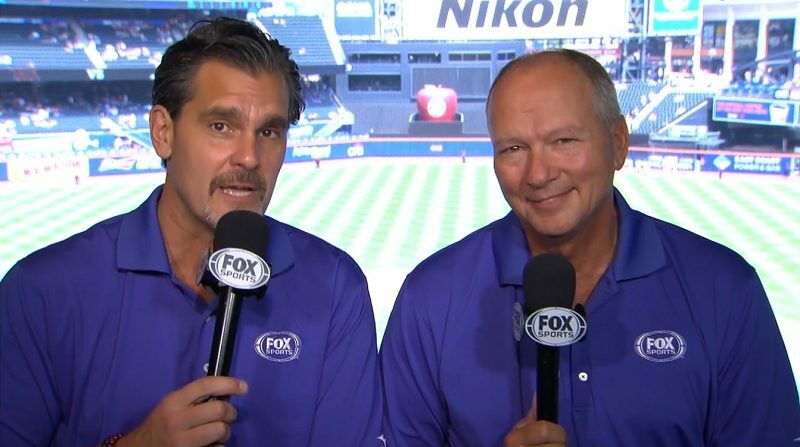 Put me down as “cautiously optimistic” for the new Braves broadcasting tandem. They could have done a lot worse in replacing Simpson, and maybe working with a younger broadcaster like Francoeur will rejuvenate Caray, much like working with Tony Romo has rejuvenated Jim Nantz in the NFL on CBS booth.